The outer casing of the machine at the Pirates ride has been altered. The elaborate pirate’s chest on a barrel has been replaced by a simpler case. The penny designs remain the same, though. 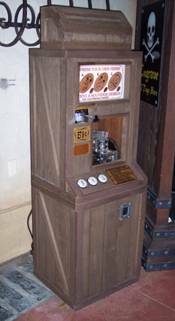 Over at the Jungle Cruise, the machine at Shrunken Ned’s has been placed into a new shell that looks like it is made of recycled plastic – the kind they use on decks. The same designs are available as before.